Repainting is a quick and inexpensive way to redecorate your living space. Before you purchase your dream wall color, you first need to determine what kind of paint was used on your walls previously. If the original paint was oil-based, you can't use a latex paint on top of it without dealing with peeling or chipping down the line. A simple cotton-swab test can determine whether wall paint is latex or oil, allowing you to move forward with your wall-painting dreams. No expert analysis or expensive tests are needed to tell whether your paint is latex or oil-based. All you need is soap, water and alcohol. Wash a small spot on the wall with a mix of soap (dish detergent is fine) and warm water. Rinse the soap off and wait for it to dry. Next, soak a cotton ball or swab in alcohol. Rub the alcohol-soaked cotton back and forth over the clean wall. If paint comes off onto the cotton ball, the paint is latex. If the cotton ball is clean with no paint, it's an oil-based paint. If your paint is latex-based, you have the choice of continuing with a latex-based paint or switching to oil. The general rule of thumb is that oil paint can go on top of latex, but latex can't go on top of oil. Latex paint won't adhere to oil paint and will chip or peel. Latex paint is water-based, making it faster drying, easier to clean and better for the environment. Oil paint is, of course, oil-based and covers more in one coat and is highly durable. The downside is that oil paint is harder to clean (turpentine is needed for cleanup) and takes a very long time to dry. Older oil paint may contain lead, which is a danger when sanding for repainting. Oil-based and alkyd paints dry differently than latex paints. Latex paints are made of rubber and are flexible and water-soluble. They'll be completely dry when the curing process is complete. Oil doesn't evaporate in the same way water does. Oils absorb oxygen and harden, taking longer to dry. In order to paint with latex paint on a surface treated with oil paint, you'll first have to de-gloss and scuff the oil paint. A primer must be applied first on walls that were treated with oil-based paints in order for the latex paint to go on smoothly. 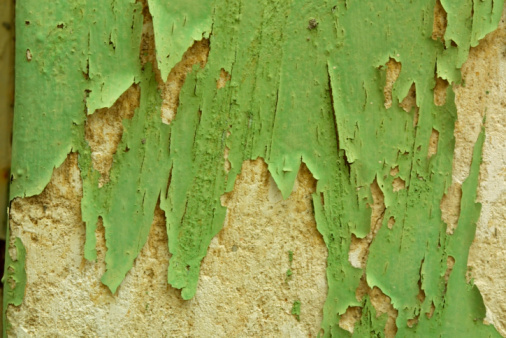 Before scuffing, take into account that 83 to 86 percent of homes built before 1978 have been exposed to lead paint. Dust and fumes can settle in oil, so speak to a professional before tackling exterior paint jobs when lead paint is involved. Interior lead paint may be just as dangerous; consider having the paint tested for lead or professionally removed before repainting.